18 Powerful Marketing Plugins in One! Watch the video above for a Zotabox review and a quick tutorial. For a full review of each tool available in Zotabox and more information including pros, cons and ratings for anyone looking to use Zotabox, keep on reading. ZotaBox offers a 14 day free trial. After the trial, you can get a 9.99$ per month account and access, program and personalise all 18 marketing extensions. Here is a quick look at each extension in the order I recommend using them! My review is specifically for entrepreneurs, marketers and programmers looking to add powerful marketing functionalities to their websites. Popups are the first thing that brought me to ZotaBox. I was looking for a plugin that would allow me to configure popups extensively. I was looking to create a popup that would only appear for new visitors, on a specific page, upon exit only. And that is possible with ZotaBox Popups, and more. The image above shows the popup editor. You can use popups for promotions, deals, lead capture (email) and more. Customize the background images and buttons. Easily add social sharing buttons (Facebook, Twitter, Reddit, Tumblr, LinkedIn). You can also add a countdown timer to your popup to create a sense of urgency for short-time offers. The image above shows some of the display options you can choose from. Display popups to all visitors, new visitors, returning visitors, or active visitors only. You can also set an activation date and deactivation date which is a huge time saver. My favourite feature is the ability to configure when to display the popup. With choices including immediately, after a certain amount of time, but also after a certain amount of scroll or upon exit. Very useful tool that provides actual ROI when it comes to lead generation. When setup well, you can very easily automate the process of building your email list with popups. I recommend using this tool if you are looking for a simple popup with complex configurations. I also recommend Zotabox popups if you would like to automate the process of sending leads to your mailing service like MailChimp. Had an issue with display (the popup was appearing for all visitors when was only supposed to appear for new visitors). However, I contacted support and they fixed the issue quickly. My second favourite tool in ZotaBox are the Header Bars. These are especially important and useful in eCommerce. This tool is awesome you would like to announce a special promotion (Free shipping), offer a coupon code, announce new arrivals or just lead customers to a new page on your site. You can make it sticky so it scrolls with the top of bottom of the page. Just like popups, this tool is very configurable. Chose who you display it for, when and on what pages. You can also use the header bar to capture email leads, or create a sense of urgency with a countdown timer. Very useful tool that provides ROI for lead generation and generating more sales. I especially recommend this tool for anyone in eCommerce wanting to announce special offers. You can configure the bar to show on your whole site, or only on specific pages. This tool is essential for anyone who communicates with their audience or customers using Facebook live Messenger. Zotabox allows you to quickly and easily setup facebook messenger on any website. Like I spoke about in the video above, the solution offered in Wix is overpriced an inefficient. I truly recommend this plugin if you would like to use Facebook Live Messenger on a Wix site. Very useful tool for anyone who uses Facebook Live Messenger to communicate with their clients. This is an excellent way to provide quick customer service. You can integrate with chat bots and configure automatic responses (outside of ZotaBox). The GDPR bar / EU cookie notification bar is super easy to activate. I used Notification Boxes to replace another (paid) tool I was using. I have set them up to inform traffic of sales in my online store to reflect traffic and sales. These notifications are great to illustrate a busy store, online. 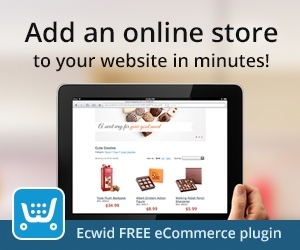 Useful to show sales or signups in your online store (ie. replace the FOMO app). Notifications are customizable and are easy to implement. I gave them a 4.5/5 due to an issue I am experiencing with them showing on all pages. I feel like they appear when they are not supposed to sometimes. I need to contact ZotaBox support on this one. This tool can be useful if it is not offered by default in your website’s theme, and if you have long pages (blog posts or other). However, do take note that this is easy to configure by default in Wix and is often included in premium WordPress themes. What really makes it stand out is that you can configure the tool to send your traffic to other pages. You can configure the tool to send your traffic to specific pages or offers. You can also configure when they appear and for whom in detail. The fact that it can also be used as a sidebar menu is a strength but also a weakness. Be careful not to overdo the use of this tool or it can distract your traffic. Useful if it’s not available by default in the website builder you are using, and if you have long pages. Especially useful if you would like to send your traffic to other pages quickly and easily. Honestly, I am not sure of the pertinence of this tool. If you think that having a testimonial popup on certain pages is important for your business, go for it. But I would not show this tool at all times on my entire site. It would be distracting to traffic. If you have an eCommerce store, I recommend using HelpfulCrowd for client testimonials on products. Could be useful, but only on specific pages of your site for specific reasons. Make sure to use this tool with a lot of thought and reason behind your decision in order to not distract your traffic. This tool is less and less important in the online marketing world. Sending your traffic to social media is counter intuitive. The second your traffic sees their best friend on the other side of the world sent them a Facebook message, they are off of your website and onto Facebook. You want to keep customers on your site, not distract them. Could be useful, but only on specific pages of your site for specific reasons. Make sure to use this tool with a lot of thought and reason behind your decision in order to not lose your traffic. Same comments as for #7 Social Buttons Bar (Desktop), but worse. These buttons are bigger and even more distracting on mobile. I dont recommend using them. However, if this is something you need for very, very specific and well thought reasons, it is easy to setup. Not recommended at all. Buttons are large and distracting sending traffic off your website and to social media. Looking to learn how to sell online? 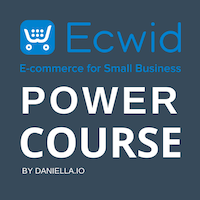 Check out my Ecwid eCommerce Power Course to learn how to sell online quickly and easily today! 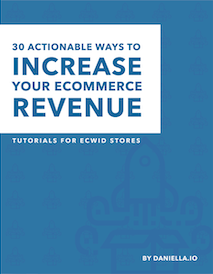 Over 60 concise tutorial videos demonstrating how to create an online store, generate targeted traffic, and get more sales! This tool resembles the Slide Box (number 11) with less movement. It can be useful to notify customers of special offers or to direct traffic to specific pages on your site. If you do not over use ZotaBox tools on your site, this can be useful to gently nudge traffic to a certain direction. Can be useful to show specific offers to customers or to direct traffic to specific pages on your site. Make sure to not activate this box with too many other ZotaBox features (ie. dont use the promo box and the slider box together). This tool is like a mix of the promo box and popup. It allows you to inform customers of an offer or request they join your email list. Can be a more subtle twist on a popup. I’m going to be tough on this one… Don’t get me wrong, Zotabox is an amazing tool to make popups, header bars and notification boxes. But it is not a landing page builder. There are much better marketing tools built specifically for landing page making, and ZotaBox is not one of them. This is a fairly new feature and they are working on it, so it may get better in the future. Zotabox is not a landing page builder but this tool could be useful if you need a quick solution. If you are a marketer or are looking to track conversions, I definitely suggest sticking to robust tools like Unbounce for PPC Ad optimization or Elementor for WordPress. Looking for a Landing Page Builder? Here are two solutions that are much more powerful than ZotaBox when it comes to building landing pages. Specifically for conversions or maximizing ROI on PPC ads. Unbounce is the best landing page builder I have ever tried for increasing PPC conversions and maximizing paid ad ROI. This is a powerful tool that is easy to use and setup. Excellent A/B testing capabilities made for conversions. Elementor turns your WordPress site into a drag and drop builder! Making it super easy to create professional landing pages. Create templates and easily transfer blocks to more than one page. Easy to use and setup. This tool is great if you would like to setup push notifications on your website. Easily notify customers of new products, or readers of new blog posts. Easy to implement and very useful to send push notifications to customers. This is an effective way to grow your email lists and generate leads. This tool can be useful to reduce the number of plugins on your site, especially if you are using WordPress. If you need multiple forms, this can also be an easy way to create them and send them to an email service. You can easily embed these forms to any website. The tool also ads a tab to the bottom of the page so your customers can easily click and contact you. Easy to implement and very useful to reduce the number of plugins on a WordPress site. Awesome to add contact form capabilities on a custom site. Integrates with multiple email solutions and adds a Contact Us tab to your page (which you could also hide by default). This is a great tool if you have a brick and mortar store. Adding a map to your site can easily help customers find you. However, this is a popup-style map that can only display one address and it is not very customizable. Easy to setup and can be useful but would probably better if embedded on a page. This is more of a popup-style map that can only display one address. Once again, I’m not sure of the pertinence of this tool… It allows you to request your customers to review you on Google or Facebook. But what if your traffic is not a customer? What if they are a cold lead who knows nothing about your business? If you use this tool I highly recommend only showing it on pages that are displayed to people who know your business (returning traffic) and have purchased from you or worked with you at least once. If not you risk having to manage damage control. Make sure Facebook or Google Reviews are relevant and important for your business if you activate this tool. Do not show it on all pages on your site. Be selective in your display options and this tool can be useful to grow your Facebook or Google reviews. Distracting and counter productive if not used correctly. The Easy Banner Tool in ZotaBox is similar to a couple other tools offered by ZotaBox. It can be useful to notify customers of special offers or to direct traffic to specific pages on your site. Make sure to not activate this box with too many other ZotaBox features (ie. dont use the promo box, this tool and the slider box all together). I am honestly not convinced about this tool… It adds a 1990’s looking post it note to your website. Highly unrecommended. I would stick with ZotaBoxe’s greatest strengths, popups, notification boxes, Facebook messenger live chat and header bars. Not useful and looks very early-internet. WordPress Users: Who want to reduce the number of plugins on their site. The less plugins the better! And ZotaBox can cover up to 18 plugins. Having less plugins reduces the chance of theme incompatibilities, crashes and down time on your WordPress site. Wix Users : Who need more advanced popups (customizable) and who are looking to add Facebook live messenger to their site. Ecwid Users Using the Ecwid Starter Site: ZotaBox is perfect to add more marketing functionalities to your eCommerce store. Marketers, entrepreneurs and anyone who does not know how to code and wants to add any of these tools to their site. Don’t over do it. Stick with necessary tools and configure them to be as helpful and as useful as possible for your traffic. The Zotabox login is accessible here. My #1 Recommendation would be to not overdo it. As effective as their home page is to demonstrate and sell their solutions, don’t let your own website look like ZotaBox’s home page – a mess of marketing tools. Keep it simple, and effective. Happy selling!